The Faculty of Shucri Ibrahim Dabdoub of Business Administration held its annual educational Business Market from Saturday, April 28 until Monday 30 April 2018. Senior business students implemented their final seminar projects in a real market environment where they set up their booths and sold various products. The auditorium was packed with visitors including many staff and students from the various faculties, as well as a large number of outside visitors. During the opening ceremony, Dr. Fadi Kattan, Dean of the Faculty of Business Administration, spoke of the faculty’s achievements especially in regards to the business market which began to spread among other universities. 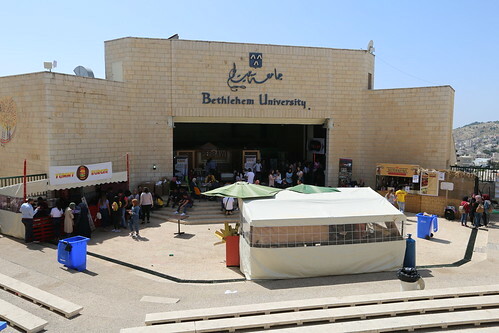 Brother Peter Bray, Vice Chancellor of Bethlehem University, said that students in the market are putting into practice what they learnt in the classroom, this is a practical way of the education that Bethlehem University is providing. He also stressed the importance of the Business Market in allowing Bethlehem community to engage with Bethlehem University. The three days market was very well attended. Senior business students are looking forward to receiving their final grades and graduating after the successful completion of their seminar projects.